Lucas Warren Photo from Facebook. 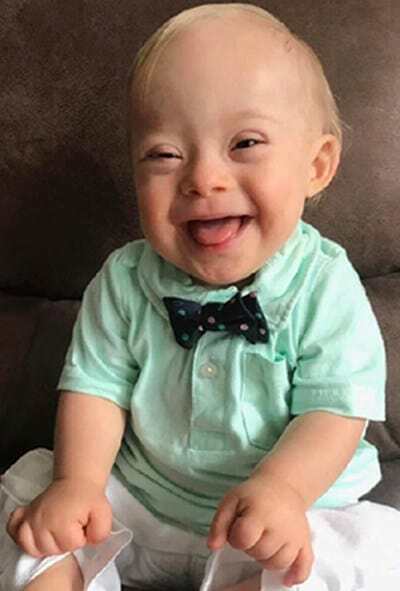 CLEVELAND, Ohio (BP) — A smiling baby with Down syndrome is making history as the Gerber “spokesbaby” just as a growing list of states are trying to criminalize the abortion of babies diagnosed with the genetic disorder in utero. A federal appeals court heard arguments Friday (Feb. 16) in Indiana’s two-year battle with Planned Parenthood over a law criminalizing the abortion of babies with disabilities such as Down syndrome, the Indianapolis Star reported at IndyStar.com. The 2016 measure, which Vice President Mike Pence signed into law during his gubernatorial term, has been blocked by a permanent injunction since September 2017, IndyStar said. In Ohio, the American Civil Liberties Union and Planned Parenthood filed a lawsuit Thursday (Feb. 15) to block a similar law set to take effect March 23 there. In Utah, a bill making it a misdemeanor to abort Down syndrome babies has passed the House and has been introduced in the Senate Rules Committee. North Dakota in 2013 became the first state to criminalize abortions based on Down syndrome diagnoses. The law has faced no legal challenges, the Associated Press reported Thursday, because the state’s blockage of abortions after 16 weeks has prevented the measure from becoming an issue. In selecting a baby with Down syndrome as its 2018 spokesbaby, Gerber said 18-month-old Lucas Warren of Dalton, Ga., simply beat out the other 140,000 entrants in the 8th annual contest. Lucas’ mother Cortney Warren said his selection is a plus for babies with special needs. Southern Baptist editor Will Hall, the father of an adult son with Down syndrome, told Baptist Press he and his wife Catherine hope Lucas’ selection will shine a light on human dignity and worth. Nationally, about 6,000 babies are born each year with Down syndrome, according to the latest statistics from the National Centers for Disease Control. Estimates of U.S. babies aborted with Down syndrome range from 65 percent to 90 percent, but the lack of data collection makes it difficult to determine an accurate number, life advocacy research group Charlotte Lozier Institute reported in 2015. In the international community, Iceland has boasted of nearly eradicating the birth of babies with Down syndrome through abortion, with only one or two babies born with the condition annually in the nation of 330,000, CBS reported in 2017.